Join us for 14 eco-adventures from October 2016 through September 2017. Get your free Paddle Passport on your first paddle trip with us, then fill your passport with more paddle ecotours through September 2017 to win World Rowing Championships VIP tickets and logo gear! 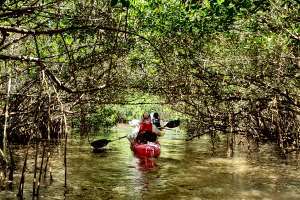 Explore the mangroves and sea grass beds of Neal Preserve while learning the story of the ‘Comeback Kid’, Sarasota Bay. 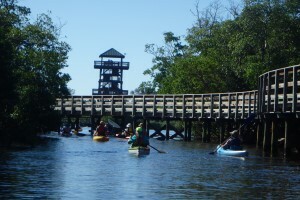 An easy paddle of 3 miles featuring Mother Nature’s own version of sustainability, an estuary. 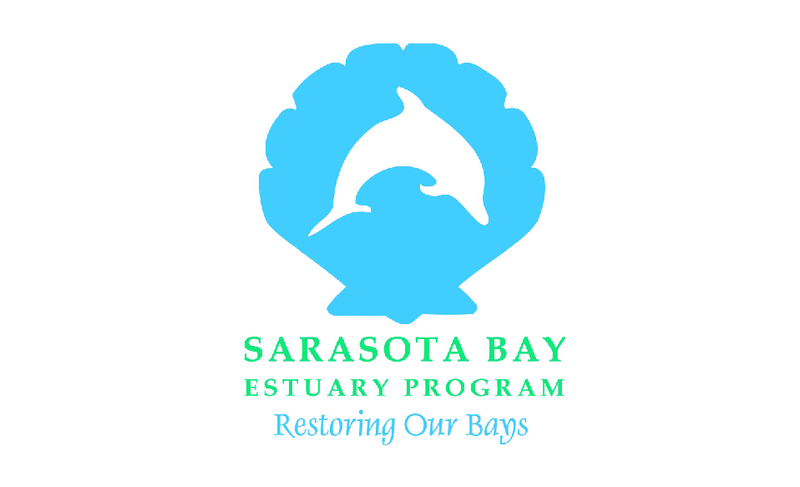 Help find, identify and learn about the plants and critters which make Neal Preserve and Sarasota Bay their home. There will be plenty of time to take pictures and use your 5 senses, tasting optional! Expert guide and all equipment included. $10 per person. Emerson Point Preserve is a special place where land meets sea and na­ture flourishes. 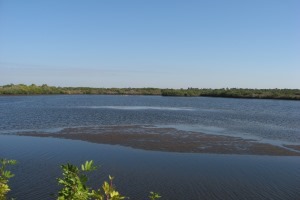 Formerly occupied by pre-European indigenous people because of its natural abundance, Terra Ceia Bay and the Manatee River join at this Preserve and mix fresh water with salt water, known as an estuary. Usually a fairly easy paddle of 4 miles, birds, crabs, fish, and whelks are always in abundance with an occasional sighting of manatees and dolphins. Kayaking doesn’t get much cooler than this. Take a break from the sun and join us for an evening paddle on Sarasota Bay as we explore Florida’s coastal waters at dusk. 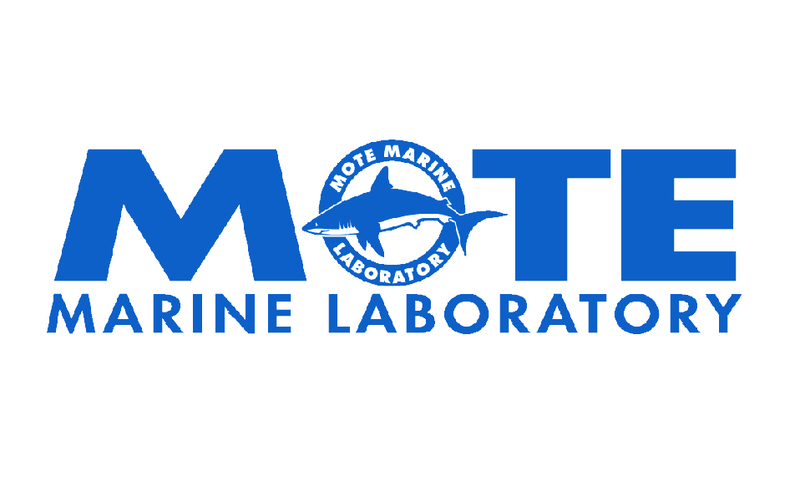 Discover the animals that bring Sarasota Bay to life at night while taking a relaxing paddle on the moonlit waters around Mote Marine Laboratory. Class begins with basic kayaking instruction. An easy paddle of 3 miles, enjoy the photographic view of the sun setting over Anna Maria Island. Dip netting before sunset in the sea grass beds of the Manatee River is definitely a highlight of the trip. Our return trip will kick start night paddling, a ‘star’ adventure. December is the best time of year for star gazing. Learn about the award winning restoration of uplands, salt marshes, salt flats, mangroves and a tidal estuary. Start your trip from the Sarasota Bay side of Coquina Beach and enjoy a quiet morning paddle around Leffis and Jewfish Keys. 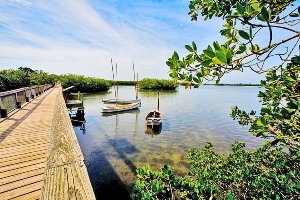 Leffis Key is an island preserve with footpaths leading to a 360-degree vista over Sarasota Bay. Jewfish Key, accessible only by boat, houses a quiet nature preserve that is home to a multitude of wildlife. This paddle and nature walk allows paddlers time to see a classical black­water river as it meanders through an upland freshwater marsh, prairie marsh and floodplain forests. A naturalist led trip includes interpretation of natural and human history of the area. An optional easy hike to the first canopy walk in Florida is included. Expert guide and all equipment included. $10 per person. Park fee of $6 per vehicle collected at the park entrance. 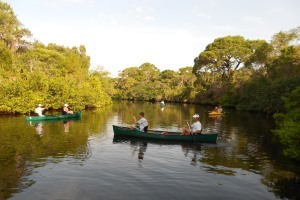 Explore the Blind Pass coastal lagoon on Siesta Key before paddling out to Little Sarasota Bay. There, you’ll see Bird Keys, prized for their mangrove wetlands that are prime habitat for local wildlife. See quiet, little-known parts of this busy waterway with your knowledgeable guide. 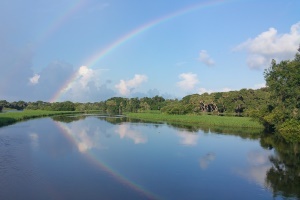 Enjoy a beautiful sunset, nesting wood storks and the leisurely swim of gentle manatees as you explore the Lower Myakka River. 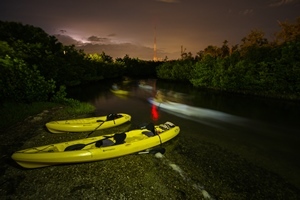 The 4-mile round-trip paddle takes you to Tarpon Point Landing, a secluded spot ac­cessible only by paddle craft, and protected by Conservation Foundation of the Gulf Coast. Explore beautiful Lyons and Blackburn Bays, quiet estuaries nestled among Casey Key, Osprey, and Venice. 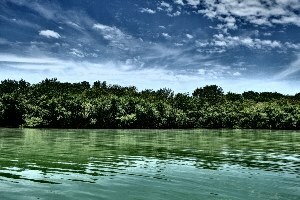 Here, you’ll see mangroves aplenty and learn about how they support our way of life in Southwest Florida. Make sure you keep a close eye out for the dolphins that reside in these bays year-round! A fairly easy 2 mile paddle to one of Audubon’s protected rookeries. 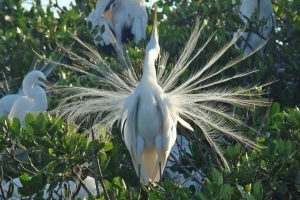 Learn about the birds of southwest Florida’s coast. Roseate spoonbills, great egrets, great blue herons, wood storks, cormorants make this little island their home for mating and nesting season. While we’ll be close enough for some great photos, we’ll follow ‘no disturbance’ practices for bird photography to avoid stressing the birds. 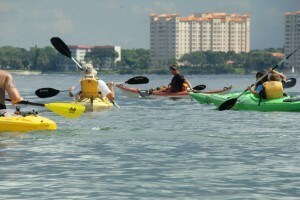 While not for first time kayakers, beginning kayakers are welcome. Launch by kayak or stand-up paddle board from Historic Spanish Point. 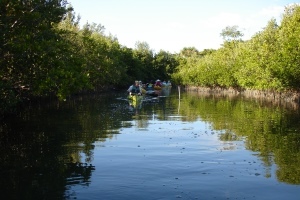 This is a special paddle, amongst mangroves and around the Neville Preserve in Little Sarasota Bay with a visit to the original Mote Marine Shark Tank (an enclosure at Midnight Pass that has now been reclaimed and surrounded by man­groves) and a short hop/portage over a dune to the Gulf for a swim at iso­lated Midnight Pass Beach, not accessible by car. Manatees & more await! Join a Park Ranger on a leisurely paddle along the mysteriously dark waters of South Creek tidal estuary. Go back in time and immerse yourself in nature’s splendor while explor­ing several unique habitats to see who may be home. Expert guide and all equipment included. $10 per person. Park fee of $5 per vehicle collected at the park entrance. 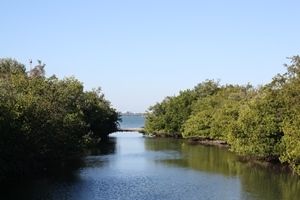 Gamble Creek meanders for several miles through oak hammocks and through salt marshes before joining with the Upper Manatee River to form the Manatee River. Our adventure begins by paddling up the creek as far as we can go. We turn around and enjoy the diversity of habitats on our adventure downriver. Twin Rivers Preserve will be a rest stop along the way. While not for 1st timers, beginners who can paddle 4-6 miles are welcome. 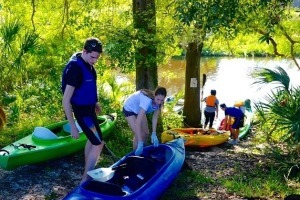 During this morning kayak of Phillippi Creek, sharp observers can expect to see a variety of birds, fish and the possibility of an alligator or a manatee. Learn about ongoing watershed improvements regarding stormwater, wastewater, natural systems and opportunities for green practices at home. 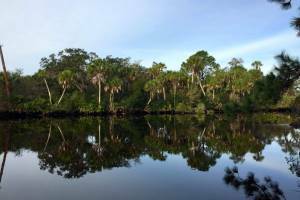 Travel from freshwater into saltwater habitats and see a new side of Phillippi Creek. 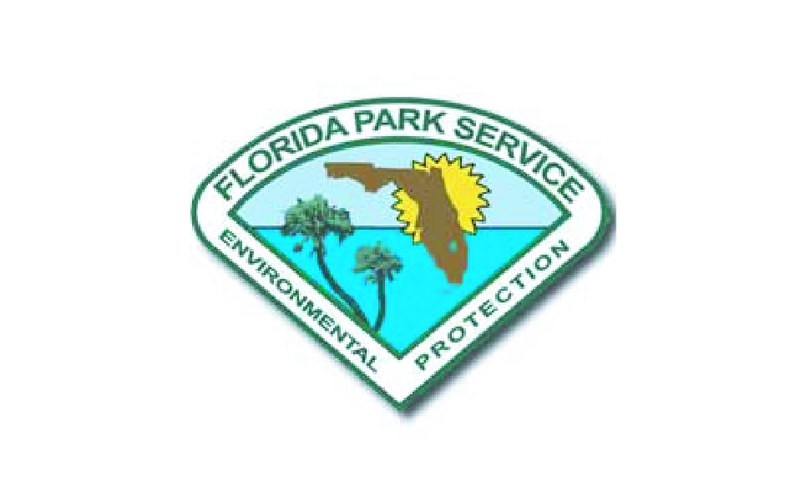 This is a paddle cleanup; trash bags will be provided. Is the trip you want sold out? Sponsored by the 2017 World Rowing Championships. Thanks to our partnering non-profit organizations and paddle guides for donating their time to lead these amazing ecotours!